Bed Guards from Safety 1st, The First Years and Tomy. Have you just moved your child into a big bed? 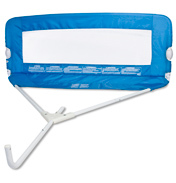 If your worried about them falling out and hurting themselves, then a bed guard is a great idea just until they get to know their boundaries. They simply attach to the side of the bed without the use of power tools, so there's no need to worry about damaging the bed.